Since 2009, Healthy Appalachia Institute has supported seven UVa-Wise students as Global Health Scholars, in collaboration with the U.Va. Center for Global Health. Students spend their summer in Limpopo, South Africa working with a research team of student, and faculty from U.Va. and The University of Venda. 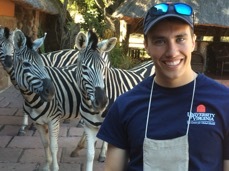 Nathan McGlone, the 2015 Global Health Scholar received additional funding from the UVa-Wise International Programs Scholarship Committee to support his travel to South Africa. His research focused on ‘Community Health in Limpopo: Exploring Management of Diabetes and Hypertension in a Nurse-Led Community Based Health Center in Limpopo Province’. Here is an article that he wrote.